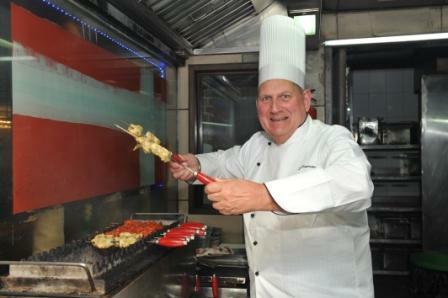 Recently, I was invited by Barbeque Nation for their food fest – Pat Chapman Grills the world ( Oct 3rd to Oct 14th ). Chef Pat Chapman is a celebrity chef, writer, and a man who brought Indian food to the UK. Inspired by barbeque cultures worldwide, Pat Chapman has created 14 fabulous marinades exclusively for Barbeque Nation. Here, I am listing down some of the exclusive recipes created by Pat Chapman for the event. Vegetable oil, Horserdish sauce, salt, chopped onions fried a level below golden brown, coarsely chopped parsley and lamb mince. In a round mixing bowl, mix horseradish sauce and vegetable oil. Whisk well. Add fried onions and coarsely chopped parsley. Check seasoning. Season lamb minces with salt and pepper. Make round patties of 50 gms each and cook on pan grill. Serve hot with cool mayonnaise dip and crisp salad. In a round-bottomed bowl, mix fish sauce (which according to Pat Chapman smells like socks), lemongrass paste, chopped basil leaves, green chilli paste and vegetable oil. Whisk lightly and add fish pieces. Let it marinate for 30 minutes. Pierce pieces with a skewer and grill over a medium charcoal fire. Serve hot sprinkled with chopped fresh coriander. Chicken drumstick, vegetable oil, muscavado sugar(brown sugar), cider vinegar, rum, pepper powder, nutmeg powder, cinnamon powder, salt, chopped onion fried brown, naga or scotch bonnet chilli, fresh thyme, garlic fried. Make diagonal cut marks on chicken pieces. In a round-bottomed bowl, add all the ingredients except chicken. Whisk lightly. Add chicken pieces and marinate for 30 minutes. Grill over a medium charcoal fire. Serve hot, sprinkled with crushed black pepper. I must say, it’s a good way to start the non-vegetarian journey after Navratras. Located in a not so well-known locality of a not so popular sector in Noida, this café in sector-41 isn’t perhaps the most ideally located eatery to attract foodies but still has decent connectivity via the Blue Line of the Metro. So getting there may not be a task, but settling into the environment around might. But hey, what’s life without a little challenge – a challenge of running a premium eatery at a relatively new location and achieving delicious perfection. Yes, that’s exactly what the culinary geniuses here at Theos are doing. The moment you step inside you enter a small beautiful world of goodness – a delightful bakery with the most sinful desserts to offer and a café with the perfect blend of a modern arrangement with a little old school charm and the essence of the simple food shining through. The ambience inside is bound to make you feel or at least have you believe that you are enjoying a scrumptious meal at a beautiful place on some quiet old street of Rome. Soon you lose yourself in that robust flavourful air around you with smells of garlic and gooey cheese and that’s exactly why this place gets your salivary glands pumped and your mouth waters while your taste buds feel the tingling. Theos offers a wide menu with some of the finest and most ethnic flavours from Italy put on a plate in front of you. Among the lights of the regular Italian delights of Pizzas, Risottos and Lasagne, you will be fancied by an exciting element added by the Lebanese and Mexican platters. To please the sweet tooth, Theos offers some of the most exquisite and indulgent desserts and is one of the finest bakeries in Delhi NCR. I started my ride down the streets of Italy with a classic Italian tossed salad which was a healthy serving of fresh veggies with a burst of herbs with a generous drizzle of lemon juice and olive oil. Next came the Zuppa(soup) which was without a doubt the most interesting soup I’d had in a long time, a mushroom cappuccino, gorgeously concocted mushroom soup prepared like a cappuccino and served like one. I was craving for more yumminess. Being a crazy fan of cheese, I decided to go with the mushroom and blue cheese pasta for my mains. This had to be perfect, with two of my favouriteflavours married into one lip smacking dish. The pasta didn’t fail to impress. The sharpness of the blue cheese, with flavourful creaminess coming through from the mushrooms, and the undertone of punchy garlic from the béchamel gave this dish the perfect balance! After having had all these savoury delicacies resting in my belly, I was getting thirsty; it was now time for some sugary goodness which I completed with the silkiest, most velvety chocolate hazelnut shake I’d ever tasted. Overflowing chocolate and a rich smothering of hazelnuts, it was a perfect end to a meal that had tantalized the taste buds and rejuvenated the palette handsomely. The staff was pleasant, served me with a smile and the service was top notch. The food here at Theos has flair, character and the passion sparkles through. With a nice charm to the place and some decadent food whipped up every day, they are definitely heading for Big Chill glory. I will most definitely be returning to Theos, hungry for more.